Federal Reserve chair Janet Yellen testifies before Congress during a House Financial Services Committee hearing on Tuesday, February 11, 2014. Federal Reserve chairwoman Janet Yellen gives her first testimony before Congress since being appointed during a House Financial Services Committee hearing at the Rayburn Building on the U.S. Capitol in Washington, D.C., on Tuesday, February 11, 2014. In the way parents obsess about their kids’ “potential” — in sports, smarts or, dare I say, earnings — economists obsess about a similar question: Is the United States living up to its potential? This concept of “potential” sounds squishy, and yet economists research it intensely because it has huge implications for how the Federal Reserve responds to the sluggish U.S. recovery. On Wednesday afternoon, when Janet Yellen concludes her first meeting as Fed chairwoman, many people will focus on questions like, is the Fed going to slow its bond purchase program? Or, when will the Fed begin to raise interest rates — in late 2015, or sooner? Undergirding these questions is the much larger issue of U.S. potential. Traditional macroeconomic thinking suggests that if the U.S. economy is living up to its potential, the Fed should pull back the huge amounts of stimulus it has injected into the economy. On the other hand, if the economy is falling far short of its potential, there would be a strong argument for continuing, or accelerating, stimulus. What does economic potential mean? Questions about potential bedevil macroeconomists, because much like individual potential — What’s my ceiling as a musician? How good at basketball could he be? How far in business will she go? — an entire economy’s potential is impossible to measure. Yet we measure it anyway. An economy’s potential growth rate is an estimate of how fast it can grow if it used all available resources. Think of resources in the broadest possible sense: the available labor force (those willing to work); all the available “capital” — machines, land, buildings, etc. ; and all the technology and ideas that could boost productivity. Institutions like the Fed and the nonpartisan Congressional Budget Office combine these factors to produce estimates for the U.S. economy’s potential growth rate. This rate can change, of course. In the U.S., it’s been slowing for a while. The chart below plots the CBO’s estimate of the year-over-year percent change in potential real GDP growth rate, projected through 2024. As the chart shows, the rate has declined from about 4 percent in the 1950s to just under 2 percent today. Demographics are a key reason for this drop. As baby boomers retire, the labor force shrinks, thus lowering the economy’s potential growth. Slower increases in productivity and less investment in the country’s capital stock are also important factors. An economy can grow faster than its potential, but if it does, trouble may ensue. An economy growing too fast might trigger a quick rise in prices, or inflation. Fed officials generally want to avoid an “overheating” scenario, such as the high inflation rates experienced in the U.S. during the 1970s and 1980s. Economic growth is like Goldilocks’ porridge: You want it “just right,” not too fast or too slow. 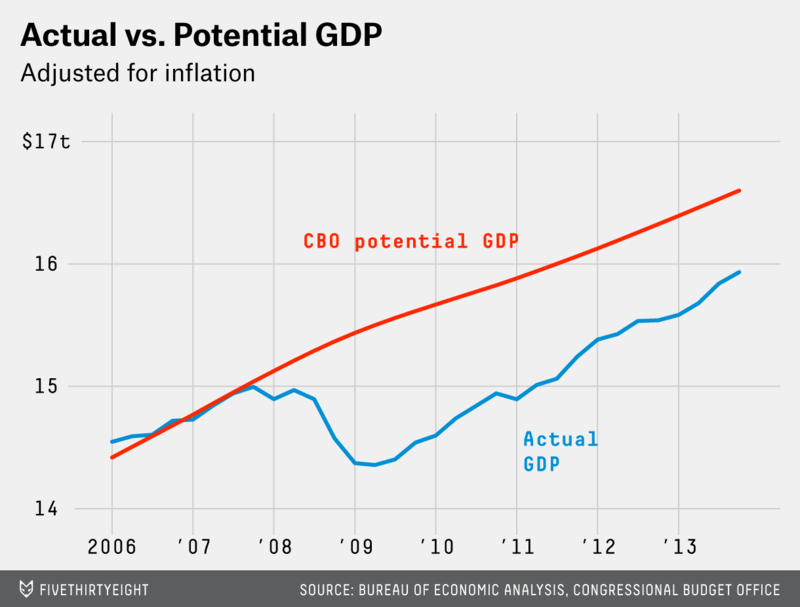 The chart below shows potential and actual real GDP levels, as estimated by the CBO and reported by the U.S. Bureau of Economic Analysis, respectively, going back to 2007. The gap between the red and blue lines is nearly $700 billion of lost potential — that’s the recession and financial crisis. This difference between actual and potential GDP has a name: the output gap. Just last week the CBO revised down its projection of potential GDP for 2017, which narrowed its estimated output gap. Some economists don’t buy the CBO’s output-gap estimates. They think the gap is small or non-existent; they might describe today’s economy as the “new normal.” This is the best we can do, they’d say. The U.S. is living up to its potential, and more monetary or fiscal stimulus isn’t going to achieve much, and could in fact have negative effects like inflation. Because the debate over U.S. economic potential is so crucial to Fed policy, central bankers track other statistics attempting to measure this concept of economic potential. In the industrial sector, for instance — which includes manufacturing, utilities, and mining — the Fed measures “capacity utilization,” which is the percentage of available resources being used. The long-run average is just under 81 percent. Today, it’s just below 79 percent. That’s not a big difference, so shouldn’t it indicate that the economy is living up to its potential? Not necessarily, because the industrial sector has grown much more strongly than the economy as a whole, especially earlier in the recovery. Is the labor market “slack” or “tight”? The jargon for unused potential in the labor market is “slack.” Measuring the extent of this slack is of great consequence — and controversy — especially at the Fed. On the one hand, the total employment-to-population ratio today is just below 59 percent, much lower than before the recession, when it stood at 63 percent. Again, demographics play an important role. The older a society gets, the fewer workers there are relative to the entire population. But even when we focus on working-age adults — people between the ages of 25 and 54 — the labor market slack seems abundant. If the economy has been growing above its potential for a while, thus “closing” the output gap, we would eventually expect to see inflation. 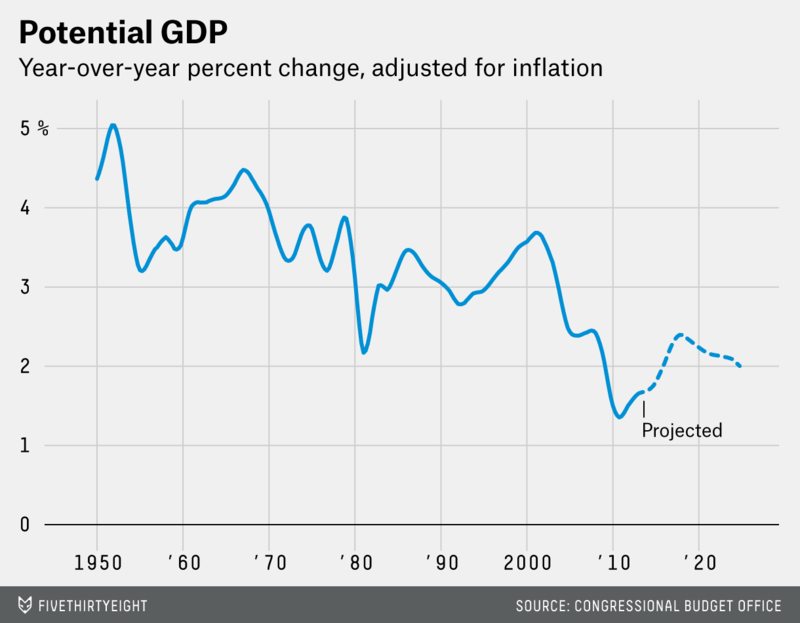 So far, we haven’t; inflation has not been a problem for the U.S. economy in recent years. Below is a chart of the Fed’s preferred measure of inflation, the personal consumption expenditures (PCE) price index. It comes in various flavors, but the two most important are shown: the overall PCE inflation rate and its close cousin, “core” PCE, which excludes food and energy prices — not because they’re unimportant, but because they’re so volatile. By measuring “core” inflation, we get a picture of the underlying inertia of inflation. Whether looking at “core” or overall inflation, the picture is clear: prices are rising very slowly, at just over 1 percent year over year, and well below the Fed’s 2 percent target. Why 2 percent? That’s the level of inflation the Fed believes is low enough not to be disruptive but high enough to be consistent with a growing economy. Where does Yellen stand on these questions? Yellen is often identified with the camp that argues the U.S. economy isn’t growing near its potential, and that more stimulus is needed to close the large output gap. She’s seen as more of a “dove”1 relative to her predecessor, Ben Bernanke. To employ such a strategy, the Fed would have to clearly and credibly communicate that it intends to keep interest rates near zero even as inflation rises above 2 percent. Overshooting is risky. 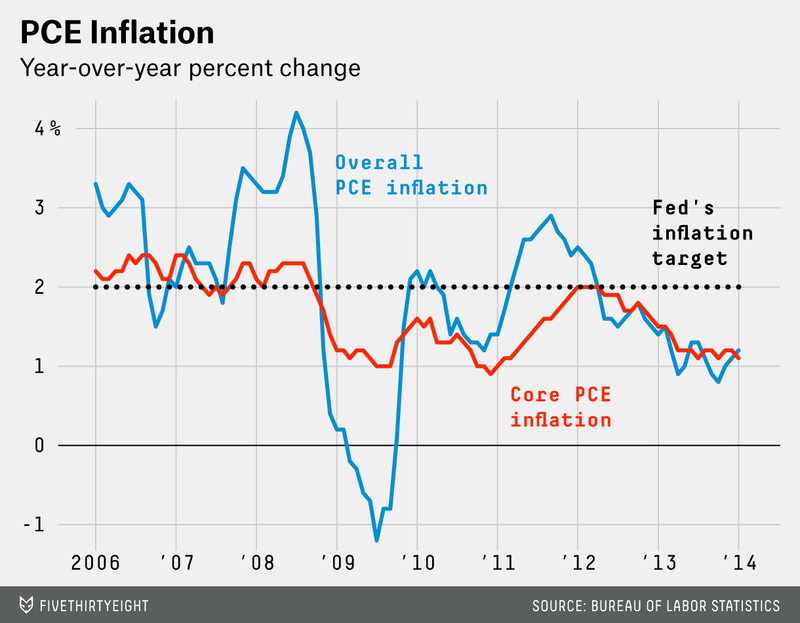 The Fed would risk its credibility as an inflation-fighting central bank. There’s also much worry that overly stimulative monetary policy could lead to new speculative financial bubbles. And then there are the costs of inflation itself. Yellen has in the past advocated for a similar strategy — or something close to it. In 2012, she made a speech highlighting a specific model whereby the Fed would allow inflation to rise just a bit above 2 percent. But adopting the strategy of overshooting would be a huge change in Fed policy. And while some argue that it’s a risk worth taking, many Fed-watchers think it’s highly unlikely the Fed will pursue it, even under Yellen. In monetary policy lingo, there are two camps: doves and hawks. A dove worries more about unemployment and less about inflation, while a hawk is more concerned with inflation. Former Fed Chairman Ben Bernanke was generally seen as moderate-to-dovish, while Yellen is seen as one of the more dovish Federal Open Market Committee members. There is another, related idea of raising the Fed’s inflation target from its current 2 percent level to, say, 3 or 4 percent. This was floated by Olivier Blanchard, the chief economist at the International Monetary Fund, and more recently argued for by Laurence Ball. We had those rates of inflation in the 1990s — an era of strong growth and a healthy labor market.